Anniversary Magazine — Design by No. During the Chinese tea ceremony, the tea master is known for the controlled precision in which she prepares and serves the tea to her guests. And yet, the taste of the tea leaves is yielded to her by the uncontrollable forces of nature’s hand. It is the same with clay. 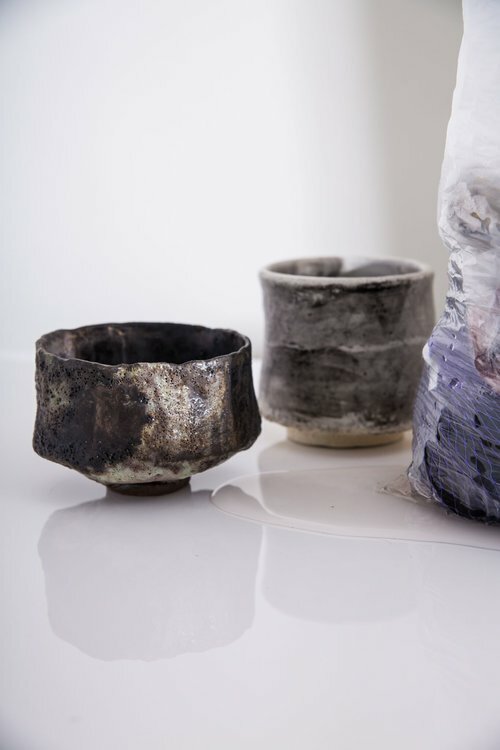 A ceramicist manipulates and moulds her piece of earth, but sometimes during firing or throwing an alternate form will persist, sometimes for the better. Try as we might, the earth knows that in order to control something, sometimes, it is best not to. In November, the “beautiful teachers” of clay and tea could be experienced together at T, an exhibition of teabowls by Brooklyn based ceramicist Romy Northover and the Sydney based Alana Wilson. The pair were drawn to the tea bowl, an ancient form still used in present day, due to its duality of the primitive and the contemporary, a duality present in each of their practices. The tea bowls made from clay and glass can be held, drunk from and purchased, at New York’s Floating Mountain, a modern tea bar that pays homage to the ancient ritual and meditative act of the tea ceremony. After T’s opening night at Floating Mountain, where traditional tea ceremonies were performed using Northover and Wilson’s vessels, we sat down with them to hear about how their T was concocted.